Each of North America’s main environments has its own grouse: Ruffed in deciduous forests, blue and spruce in pine forests, ptarmigan in the tundra, sage in high desert, prairie chicken in short-grass prairie, sharpies in long-grass prairie. Unlike most of its cousins, the sharpie has dark meat throughout. Plucked, it looks a lot like a giant dove or squab. That dark meat is full of flavor and can hold up to all sorts of other strong tastes. Ruffed grouse can, too, but I often find that what makes chicken or quail special gets lost in bold dishes. Now I normally think of roasts and slow-simmered braises when I think about sharp-tailed grouse, but it’s summertime, and I eat a lot of main-course salads when it’s this hot. This salad is definitely a meal in a bowl. 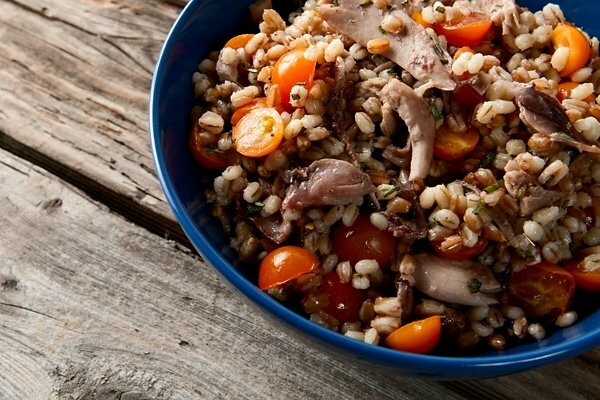 Barley provides the bulk — I chose barley because it’s one of the main crops of North Dakota — lots of poached grouse meat make it interesting, and pretty little Sungold tomatoes add a brightness that makes this dish. Feel free to play with this recipe: Use chicken thighs, or pheasant, or turkey. Skip the quail for this one, though; it’s too delicate. Cherry tomatoes look nice, but you can chop up normal tomatoes, too. No barley? 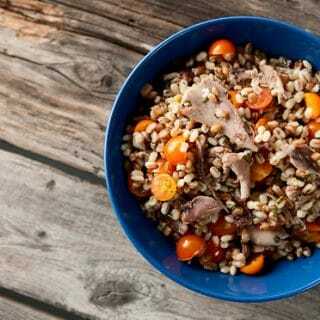 Use long-grain rice, or rye or wheat berries. Enjoy! The cooking method you use for this recipe also happens to make a great broth. If you have time, use this broth to cook the barley. If not, cook the barley in some chicken broth and reserve your grouse broth for another time. This salad is best served at room temperature. And while it does keep for several days in the fridge, my advice would be to keep the tomatoes separate if you plan on storing this salad -- tomatoes hate refrigeration, so you will be better off adding them right when you serve. In a large pot, cover the grouse with 2 quarts cool water. Cover the pot and bring it to a simmer over medium-high heat. Skim any scum that floats to the surface. Add the the carrot, onion, celery, thyme, juniper, bay leaves and marjoram and salt to taste. Simmer gently -- do not boil -- for 20 minutes. Remove the grouse and cut the breast meat off them. Return the rest of the grouse to the pot and simmer another hour. While the grouse stock is simmering, shred the grouse breast meat, moisten it with a little sunflower oil and set aside. Turn off the heat and remove the grouse. Pick the meat off the legs and any remaining meat from the carcass and set in the bowl with the breast meat. Strain the stock through a fine-mesh strainer into another pot. Bring the pot of strained grouse stock to a boil and add the barley, along with a pinch of salt. Turn the heat down to a simmer and cook until the barley is tender, about 30 minutes. Drain the barley and put it into a large bowl. 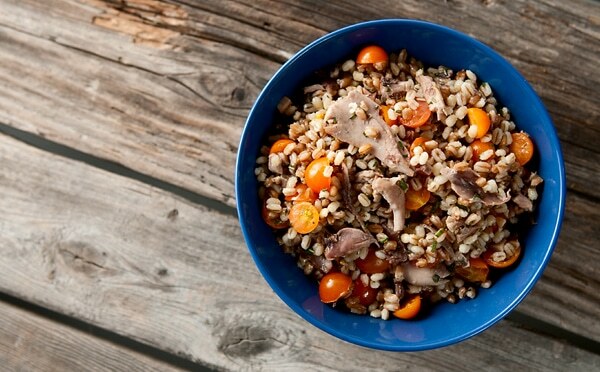 Add the grouse meat to the bowl with the barley, along with the fresh sage and rosemary. Mix in the tomatoes, sunflower oil and the malt vinegar and add salt and black pepper to taste. Serve with a light red wine, a dry rose or a malty beer. Jason: You’ll need to add an hour, I think. If you have a crockpot, that might be a way to go. Turkey legs can get really tough and I’ve found they need several hours before they want to fall off the bone.